Hot dry January and how to become a Lawnadic. Welcome to 2019. It has definitely been a baptism of fire into 2019! The hot dry weather has not created many Lawnadics. Heat and dry hot winds are never good friends to me or many of the Lawnadics out there. They are like those family members, like a great Aunt on your Dad’s side, that you know you have to see every year, but neither of you are too excited about it. So you prepare yourself with those extra bottles of wine and lots of cheese and chocolates, and look for exciting things to do to keep you all busy. You all get through it, but none of you are sure if you enjoyed it. January is like that for me. The wind is hot, and the lawns suffer. At the farm at the moment we are irrigating morning and night. We are fertilising with organic mixtures to give the grasses the strength, water retention and colour. Keeping our paddocks ready to become your new moist, green and happy lawn. And when a pallet of Coastal Turf turf slabs are delivered to your home, they are super excited to become your lawn. You offer the lawn so much. Individual attention. When you first put down your new lawn, we recommend that you water your new lawn morning, noon and night; just for 10mins per time. This will invigorate your lawn and stimulate the establishment roots, and encourage leaf growth. This will make your lawn feel like it is going from being one in a million, to becoming your one and only. And it makes it thrive! And by asking us about our drought tolerant species, you can make your one and only Lawn greener and happier this year as well as the next and the next. Like our Coastal Mix. This is the most drought tolerant lawn we have, often once established, only surviving on rain water alone with ease. Our Coastal Mix is a perfect family lawn. The type of lawn you can send the kids out onto with bare feet, and not worry. The type of lawn that others walk past and wish that they had at their place. The type of lawn that you use, rather than worry about, and it stays green fresh and fun! Like your favourite cousin who comes down and you both know you will be laughing and having so much fun you won’t even notice the time go by. This is what your new Coastal Turf lawn will feb like. You can still buy extra bottles of wine. But is going end in laughter! 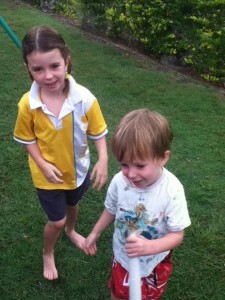 A Coastal Mix lawn is the best place for bare foot kids to play making Lawnadics young and old! So give us a call, and get rid of the stress of the Great Aunt stress of January, and invite your favourite Cousin over, and smile. And become a Lawnadic for life.